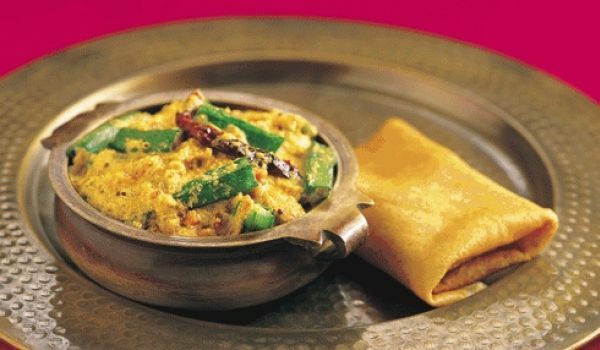 Dahi Bhindi is a very popular recipe. Learn how to make/prepare Dahi Bhindi by following this easy recipe. Chop off the tip and tail of okra and cut into 1-inch pieces. Heat 2 tbsp oil in a frying pan and splutter cumin seeds and green chilies. Fry okra until crisp on medium-high heat. Transfer into a platter. Stir fry the onions until golden. Add ginger paste, tomatoes, coriander powder, cumin powder, turmeric powder, and red chili powder. Stir well and fry for 2-3 minutes. Add okra and blend well. Cook for 3-4 minutes. Add yogurt and salt. Mix well.